But biofuels and biofeedstocks are constantly changing, and new processes are constantly being created, changed, and improved upon. The area is rapidly changing and always innovative. It is important, therefore, that books like the volumes in this series are published and the information widely disseminated to keep the industry informed of the state-of-the-art. 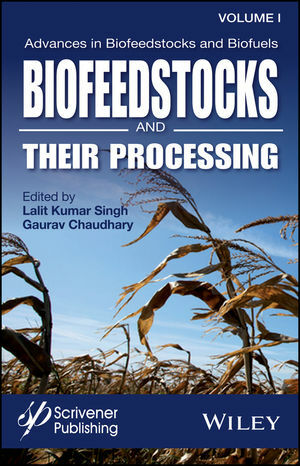 This first volume in this groundbreaking new series is a collection of papers from some of the world’s foremost authorities on biofeedstocks and biofuels, covering biofeedstocks and how they are processed. It is a must-have for any engineer, scientist, technician, or student working in this area. Lalit K. Singh, PhD, was educated at Harcourt Butler Technological Institute Kanpur and received his doctorate from the Indian Institute of Technology Roorkee. Through his research, he developed a novel sequential-co-culture technique for the efficient bioconversion of sugars to bioethanol, and important innovation in the field of biofuels and fermentation technology. He has more than 25 publications in international journals, conference proceedings, and chapters in books. He has also organized several national seminars, faculty development programs and other academic activities. Gaurav Chaudhary, PhD is an Assistant Professor in the Department of Biotechnology at Mangalayatan University, Aligarh, having earned Since a doctorate from the Indian Institute of Technolog in Roorkee, India in the field of biofuel/bioenergy. He has published five research articles in peer reviewed international journals and presented his research work in several national and international conferences. Currently he is involved in teaching & research development activities in the areas of biochemical engineering, biofuels, bioenergy, and phytochemicals.